I love my High schools main building, It has the nicest structure design in the whole LAUSD. Its nicely tucked in the Los Feliz area at 3939 Tracy St. It's Gothic design has been used in several live action and animated feature films. 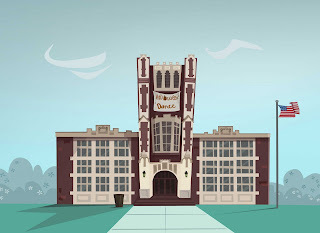 It also happens to be Macs school, on Foster Home for imaginary friends, which looks awesome. Goooooooooo Barristers!